CAPE CANAVERAL — Trouble has befallen the U.S. Navy’s new communications satellite that was launched from Cape Canaveral two weeks ago, suspending orbit raising maneuvers and leaving the craft half-way between its rocket deployment orbit and a circular geosynchronous orbit. The $340 million Mobile User Objective System satellite No. 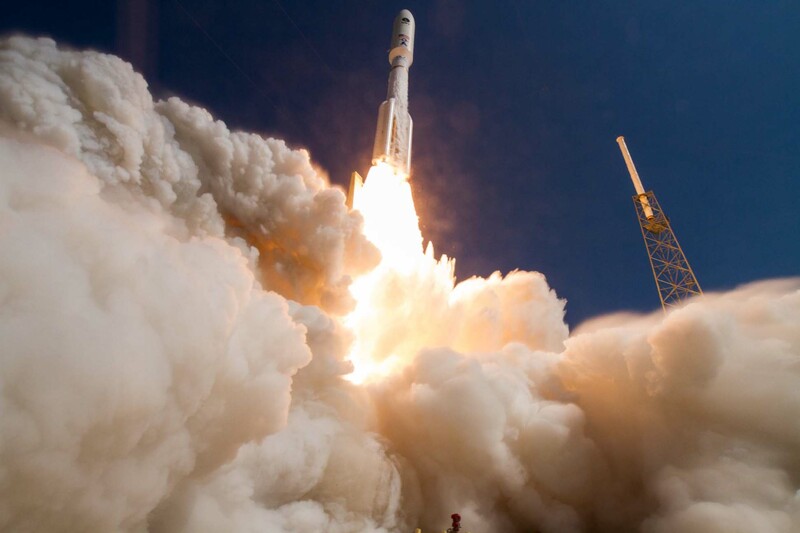 5, the last in the planned spacecraft series and the in-orbit spare for Navy’s constellation, was successfully lofted into space June 24 by the United Launch Alliance Atlas 5 rocket. MUOS 5 is designed to provide Ultra High Frequency communications to the U.S. military for the next 15 years over an area that extends from Africa to the Middle East to Asia. But a yet-undisclosed “anomaly” has halted orbit raising, the Navy’s Program Executive Office for Space Systems, which runs MUOS and is located at the Space and Naval Warfare Systems Command in San Diego, told Spaceflight Now this morning. The satellite is more than 12,000 miles away from a usable orbital perch. The nature of the anomaly, options to overcome the problem and when orbit raising could resume are details the Navy declined to reveal today. 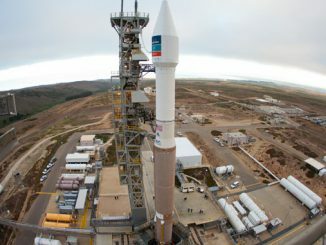 The most powerful version of the Atlas placed the 15,000-pound satellite into a customized high-perigee geosynchronous transfer orbit as planned, stretching from 2,379 by 22,219 miles at an inclination of 19.1 degrees. From that highly elliptical preliminary orbit, the Lockheed Martin-built satellite would perform 7 firings of its Liquid Apogee Engine to raise the low point to circularize the orbit and reduce its orbital tilt closer to the equator. But after an unspecified number of burns were completed, the trip to geosynchronous orbit was stopped, the Navy said in response to questions submitted by Spaceflight Now. “The satellite experienced an anomaly that required the transfer maneuver to be temporarily halted,” the Navy says. MUOS 5 currently resides in an orbit of 9,471 by 22,185 miles at an inclination of 9.8 degrees, according to hobbyist observers tracking the satellite. It hasn’t moved any higher in a week. “To this point, MUOS 5 has completed 700 m/s out of the total approximately 1300 m/s velocity change required,” said Ted Molczan, a respected satellite watcher. The satellite is headed to a 5-degree inclined geosynchronous orbit where it will match Earth’s rotation and appear locked above one part of the world. That will be the Indian Ocean region for MUOS 5. The pre-launch plan called for geosynchronous orbit to be reached and the satellite’s solar arrays and two giant antenna reflectors be deployed within 9 days of launch, or by July 3. “Nothing is more important to Lockheed Martin than mission success. We are working closely with our Navy customer to determine the cause of the anomaly,” said Chip Eschenfelder, a Lockheed Martin spokesperson. MUOS spacecraft are equipped with a BT-4 main engine, made by IHI Aerospace of Tokyo, Japan. It is uses hydrazine fuel and nitrogen tetroxide to produce 100 pounds of thrust. 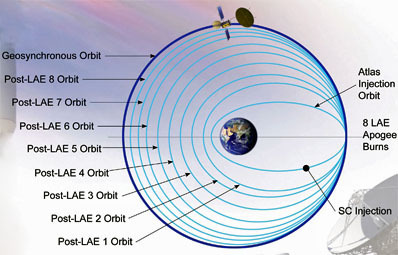 Previous satellites in the MUOS series performed 7 orbit raising burns ranging from 19 to 47 minutes in length to put the spacecraft into the proper geosynchronous orbit 22,300 miles up. The MUOS 5 satellite also has 18 Aerojet Rocketdyne monopropellant hydrazine thrusters onboard for attitude control — a dozen 0.2-pound thrusters and six 5-pound thrusters. After geosynchronous orbit is reached, Lockheed Martin initially positions the craft over the testing location in the mid-Pacific Ocean in view of a Hawaiian ground station. 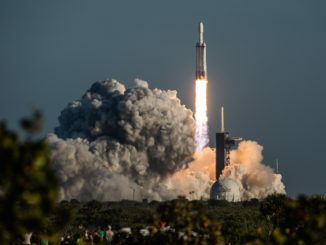 The company runs about three months of testing before the craft is relocated to its operational orbital slot and handed to the Navy for its months-long test program. MUOS 5 is intended to operate over the Indian Ocean, alongside MUOS 4. The craft is scheduled to begin service by year’s end to provide Ultra High Frequency communications services to the U.S. military. 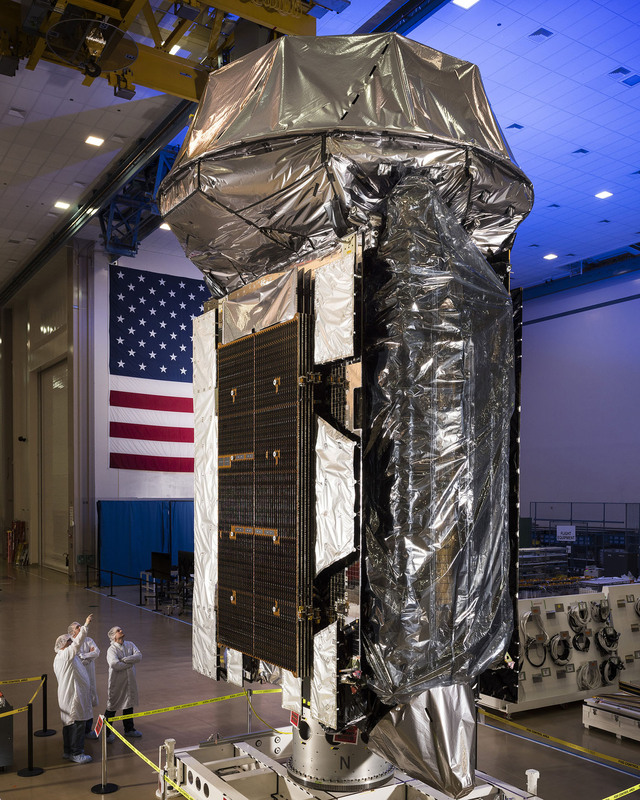 It also serves as an in-space spare satellite for the MUOS constellation’s four primary craft providing mobile communications to a rugged smartphone network for forces on the move. Coverage to legacy users will transmit through a 17.7-foot-diameter antenna on the satellite and the advanced, multi-beam features of MUOS to significantly increase the transmission capacity over the Navy’s previous satellites will use a 46-foot antenna. Still packaged in the launch configuration, MUOS 5’s two power-generating solar arrays are folded up and the umbrella reflectors stowed. The silver and black craft is 22 feet tall. All branches of the U.S. military rely upon Navy satellites for Ultra High Frequency narrowband communications. UHF offers small, portable units that forces can carry into battle and the frequency enables communications in urban canyons and mountainous terrain, penetrating foliage and transmitting through bad weather. The Navy built the $7.7 billion MUOS system — five satellites and four ground stations — to extend narrowband communications services for the military beyond 2025. The first four MUOS satellites are in use today providing legacy communications services — MUOS 1 over the Pacific, MUOS 2 to the Americas, MUOS 3 above the Atlantic and MUOS 4 over the Indian Ocean. MUOS 5 was built to be the spare, yet launched so it could quickly replace one of its sister-satellites if called upon. 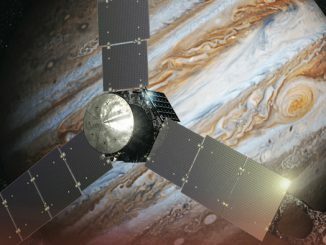 The last time a U.S. military communications satellite faced troubles during orbit raising was the first Advanced Extremely High Frequency spacecraft in 2010. A manufacturing mishap, likely something left in the satellite that clogged a propellant line, prevented the main propulsion system from firing once the craft reached space, prompting ground controllers to devise emergency plans for rescuing the mission. After 14 months and nearly 500 maneuvers using tiny electric thrusters on the satellite, the $1 billion AEHF 1 finally lifted itself to geosynchronous orbit without the use of its main engine. The spacecraft is in service today for ultra-secure communications between the president and military leaders.